Dr. Albert T.W. Simeons , born in 1900, was a British endocrinologist who is responsible for multiple advancements in research of many diseases. When researching boys with low testosterone levels, Simeons began giving them HCG and discovered that they began losing abnormal belly fat and slimmed down. In 1967, Simeons published Pounds and Inches: A New Approach to Obesity, which would help summarize and deliver his weight loss findings to the world. Decide on either 26 or 40 days HCG Diet kit. Measure out 8-10 drops of HCG solution into included syringe. Place drops under your tongue, 3 times a day before each meal. Allow 5 minutes to absorb. Do not drink or eat for 10 to 15 minutes before and after taking drops. Download our HCG Diet e-guidebook! Full of tips, tricks and recipes while on the HCG Diet! Remove blue cap that covers the tip. Make sure plunger is pushed to the bottom of the syringe’s barrel. Place syringe into the open bottle of HCG so the tip is touching the bottom of the HCG bottle. Pull plunger up so that the HCG diet drops fills the syringe barrel. Keep syringe tip over the mouth of the open HCG bottle and push the plunger down the barrel. This will release the excess HCG liquid from the syringe back into the HCG bottle. Push the plunger down. The entire black stopper of the plunger should be below the .38ml line mark on the syringe. Extracting the right amount of HCG diet drops with every dose. Place the tip of the syringe under your tongue and pish the plunger all the way down making sure all the HCG diet drops are dispersed under your tongue. Hold for at least 15 seconds then swallow. Clean syringe. Rinse with room temperature water. 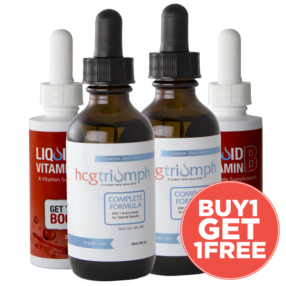 HCG Triumph customers have lost an average of 20-25 pounds while on the HCG 26-day kit. If you have more to lose, you can do multiple rounds of 26-day (with a maintenance phase between), or try our 40-day kit. The stage of “gain before loss.” This is a period of anywhere from 3 days, to one week before treatment, where patients are asked to force feed to maximum capacity. If a patient’s condition is very low, they are asked to eat to capacity for a full week. If a patient is in a satisfactory general condition, they begin force feeding on the day of their first drops. There are many reasons for this feasting, one of which is to stock the normal fat reserves before cutting the diet down to 500 calories per day. Patientsare asked to eat the most fattening foods possible, up until the day of the fourth drops. Patients are not asked to begin eating the limit of 500 calories until three drops have been taken, since it takes that amount of time for the hormone to start circulating fat in the body and making the abnormal fat deposits available. 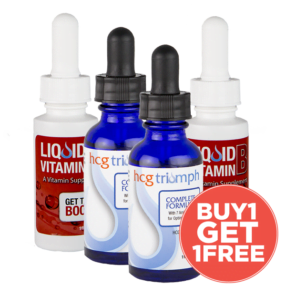 The first three drops can often be referred to as “non-effective,” since they are preparing the body for the subsequent “effective” drops which aim to deplete the abnormal fat reserves that have become available on day three. Some patients may be afraid of eating so many calories in the days leading up to the drops, but all weight gained (which can often be 4-6 pounds in 24 hours), is lost in the first 48 hours of dieting. The feasting re-stocks depleted normal fat reserves in obese patients, and the hormone draws on abnormal fat deposits only, leading to an overall healthier body. Foods that should be eaten during this period of full-capacity eating include milk chocolate, pastries with whipped cream, fried meats (especially pork), eggs and bacon, mayonnaise, bread with butter or jar, and any other fattening foods. Simeons emphasizes that concerns about this kind of eating are unfounded, and patients who follow this protocol will be rewarded with results later on. He also points out that during the two days of forced feeding between the first and third cycles of drops, some patients have noticed that they do not actually gain much weight, and in some cases have even lost weight. This can be due to proper hydration during the diet, and the release of excess water from the body, or the increased protein intake, which can limit retained water. The HCG injection, pill, and drop phase, also known as phase 2 is the bulk of the treatment and lasts the most amount of time. Each meal in Phase 2 includes 100g of meat, 3.5 ounces of vegetables, a fruit and slice of bread. HCG Dieters follow a 500 calorie diet and take drops for either 26 or 40 days. For women, the best time to start taking the HCG hormone is immediately after her period. If needed, treatment can start later, but should be done within 10 days of a period. Also to note, at least three cycles of drops should be given after the period, followed by the normal three days of dieting. On the first few days, some patients claim that they feel a difference, others feel very little. Check out more information on what to expect on your first week of HCG treatment here. Some common symptoms such as mild headaches or increased hunger can occur when first starting treatment, but generally subside. As patients move into the second and third day of the 500 calorie diet, which coincides with the fifth and sixth cycles of drops, patients should start seeing a weight loss of around two pounds per day. At around the third day, different experiences can begin to develop depending on how the forced feeding, also known as the “loading days” went. Patients who ate at their full capacity often feel much better, lighter and clear-headed. Those who have ignored the instructions of loading days, can instead feel minor discomforts for the first week. When patients reach the fourth and fifth day of dieting, the weight loss amounts begin to drop down and settle at an average of around 1 pound per day. Men often lose weight more consistently over the 23 or 40 days, whereas women can go through fluctuations when it comes to average weight loss per day. Your first week on Phase 3 of the HCG Diet, you should increase your calories up to about 700-900. Do this by increasing Phase 2 approved foods like your protein serving and your vegetable serving. Only add in one or two new foods this week. We recommend starting with new fruits and veggies. Your second week you should increase to 1000-1100. During your second week you can try adding in pork, turkey, greek yogurt or white cheeses. Monitor what you eat closely so if you gain weight you’ll know exactly what you changed and what you need to cut out. The third week you should be eating between 1200-1300 calories. You can broaden your meat selections by trying salmon or pepperoni. In your third week you can also try mayo and milk. Your fourth week on Phase 3 of the HCG Diet should include 1300-1500 calories of Phase 3 approved foods. At this point you should be able to try anything on the list without gaining weight. The body can create a tolerance to the HCG hormone, and as a result, the lack of calories will leave dieters weak and malnourished. Another problem is being too eager to increase caloric intake following the diet. Patients begin to realize that they can eat fairly normally without regaining any of the weight. Simeons protocol states that during this time, however, they should avoid sugar and starch for a while. Small amounts of foods such as egg, cheese or milk should be introduced slowly and carefully, not all at once. Easing the body back into consuming more calories should be done in small increments to help it better adjust. When it comes to protein, the opposite should occur. Patients are encouraged to consume a large amount of protein in order to make up for any deficiency while on the HCG diet. Foods such as eggs, steak, and cheese can all be consumed in large quantities during the days following treatment. While the hormone can provide incredible benefits and results in just a few weeks, the way in which it should be done is strict, but easy to follow. The most important thing, is to follow a physician’s instructions when thinking about joining the HCG diet.